Shawnee, Kan., Public Works has discovered a solution to storing mounds of salt in ClearSpan salt storage buildings, which allow equipment and loaders to more easily maneuver with spacious interiors and no support posts. Shawnee County, which surrounds Topeka, Kan., saw a need for a larger building for the county’s road salt storage. After researching several fabric tension storage buildings, Tom Flanagan, deputy director of public works in the county, determined an engineered ClearSpan Hercules Truss Arch Building was the right solution for his department. Before their new structure was erected, Shawnee Public Works used smaller buildings located throughout the county. Each of those smaller structures, however, had limited storage capacity. Flanagan chose to construct one large 54-foot-wide by 100-foot-long ClearSpan fabric structure capable of storing approximately 2,000 tons of road salt. Flanagan’s department would use this site as the county’s central distribution point. The Shawnee County public works group says they look forward to using the storage building for the upcoming winter. “We’re very satisfied with our new ClearSpan building, as it gave us the ability to centralize our salt operation for this impending winter,” says Flanagan. He also has some advice for other public works managers who are thinking about making a similar purchase. “Make certain the company selling the building fabricates, delivers, erects and warrants the completed building,” Flanagan says. With spacious interiors and no support posts, ClearSpan salt storage buildings allow equipment and loaders to more easily maneuver. 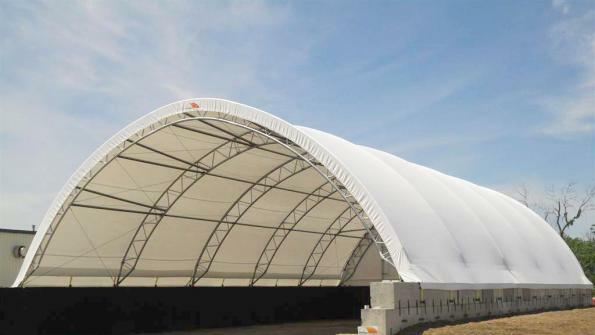 Windsor, Conn.-based ClearSpan Fabric Structures manufacturers tension fabric buildings, and has been in business more than 30 years. The company offers American-made structures with in-house engineering, manufacturing, financing and installation.